As I run my hands through my hair, I immediately feel a crunch. My frozen follicles have cast my wavy ’do firmly into place, a crystalized pompadour sculpted by sub-zero temperatures. It’s weird. But not as weird as what I can see around me — or, rather, what I can’t see, since I’m surrounded by thick clouds of steam, and my fogged-up glasses blind me to the hazy orange sunset beyond the mountains. There’s snow everywhere. A bathroom break means tiptoeing over a thin sheet of ice. I choose to ignore all this, slinking back down into the hot water, wrapping myself in a soothing blanket of sulphur and minerals. But it’s not just any water. 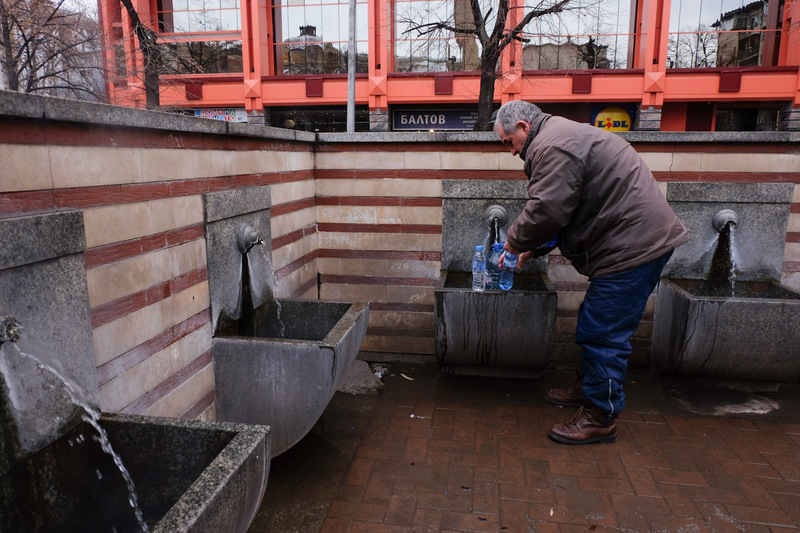 This is the hottest water in Bulgaria — or it was, anyway, when it erupted from the ground at 103 degrees Celsius. Bulgarians are proud of their country’s bountiful natural hot springs. There are more than 200 here, the second-most of any country in Europe after Iceland. 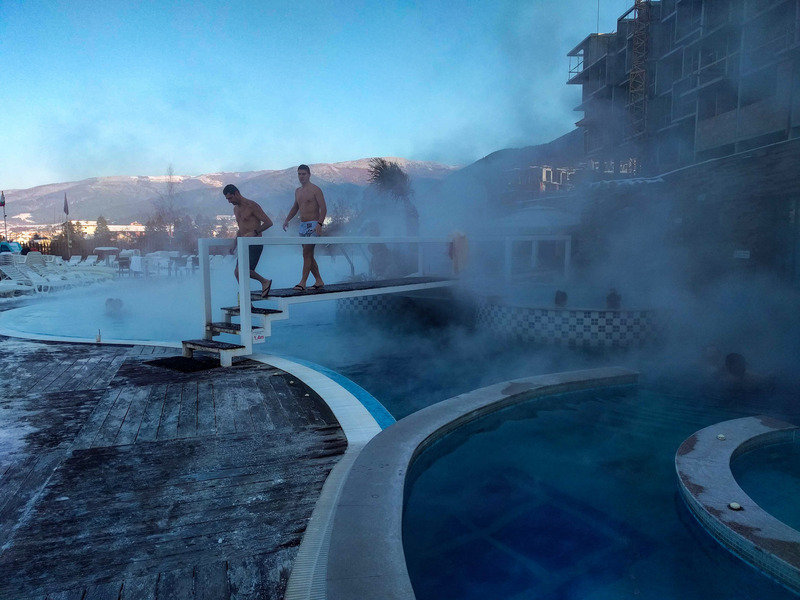 Here at Sapareva Banya, 80 kilometres south of the capital of Sofia, the country’s record-setting boiling water is tempered to a balmy 36. Down the street, a geyser spews fuming, sulphuric-smelling water from the same spring into the air, the molecules freezing in droplets to statues. 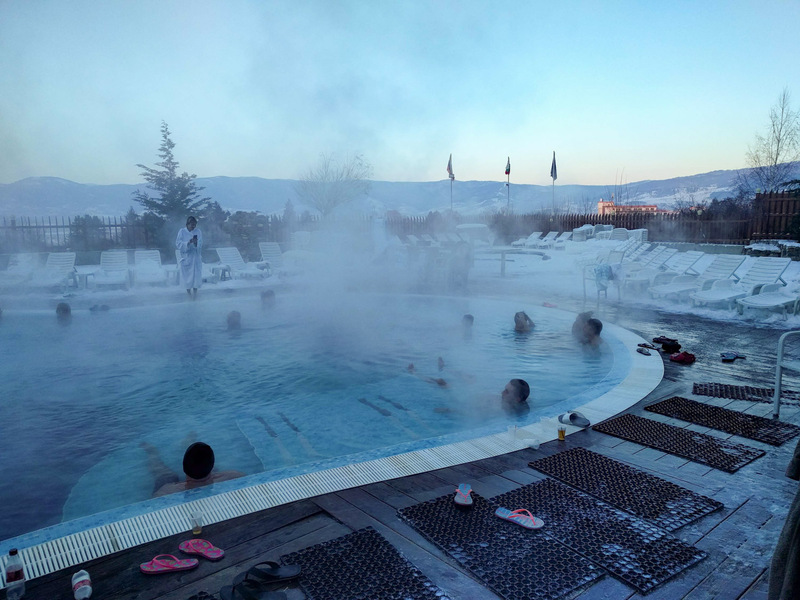 The natural hot springs of Sapareva Banya with a view of the vast surrounding mountains. Hot springs aren’t the only draw to Bulgaria in January, but they are a pretty good one. The country is a true winter wonderland, a destination for travellers from warmer climes seeking mountainous winter sports, bubbly hot springs and simmering pots of stew. Since my wife, Vee, and I aren’t skiers, we wanted to see the country’s less obvious winter side. Our time in Sofia began at yet another hot spring — but not one for swimming. 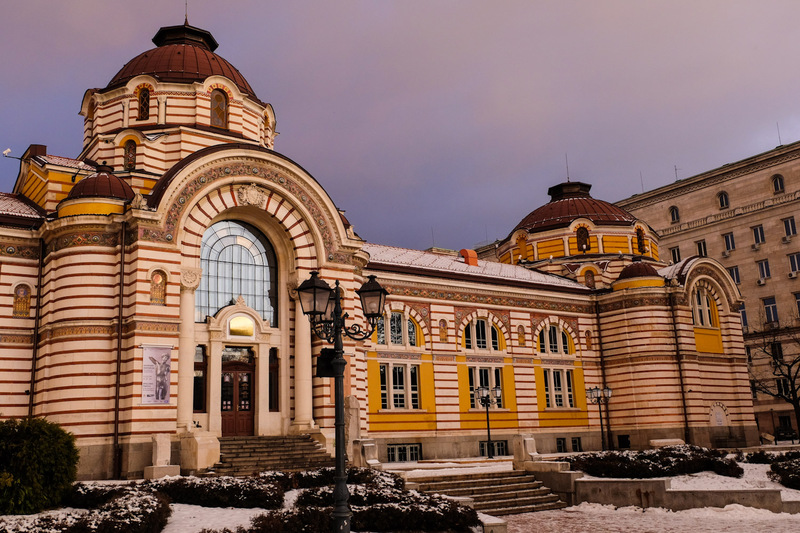 Squarely in the city center, next to the Regional History Museum, a former public bathhouse built in Viennese Secessionist style, with broad parallel lines underscoring Orthodox domes and textured archways. Across the street, steaming water fountains pour out endless streams of hot water for locals to drink. At all hours of the day, any time of year, you can find at least a dozen locals filling up four-litre plastic jugs with this water, said to be rich with healthy minerals. I refilled my bottle three times with the stuff, as soothing as a warm cup of tea, before a stocky man in a purple ski jacket approached us inquisitively. The former site of a Roman mineral bathhouse is now Sofia’s Regional History Museum, next to natural hot spring fountains. “You seem interested in this area,” he began, launching into a brief history lesson about how this site was a popular public bath for centuries: the Romans, Byzantines and Ottomans all realized its value, he explained. In fact, this spring’s location was likely the main reason Sofia was founded at all. Choir music sounded like as good a way to stay warm as any, so we agreed to visit after our day of heat-oriented sightseeing. From the public baths, we wandered the underground Roman ruins of Serdica, a heap of stones uncovered beneath Sofia’s busiest intersections. In any other city, Serdica would be a significant tourist attraction; indeed, it may be here during peak season as well. In early January, however, the archaeological site lay bare and vacant, open to anyone to walk over and around, under a dark ceiling with dim lighting that made the whole environment resemble more a cheap underground mall than a 2,200-year-old landmark. Down the path, 13-year-old girls played pop music from their smartphones, practising their hip-hop dance routines. We saw no other tourists. A local man fills his plastic jugs with mineral-rich hot water. Back above ground, Vee and I retreated from the cold to a new cafe called Rainbow Factory for cups of spiced chamomile and mint tea, paired with a sweet banitsa — a coil of soft, flaky dough casing a type of bread pudding packed with raisins and dried fruits. The cafe’s exposed brick and broad wooden boards, the eerie cartoons of pupil-less nautical figures, all set a perfectly hip scene to keep us cozy until our friend’s performance down the street. We arrived to hear him shortly before six at the Alexander Nevsky, Sofia’s most iconic building. The cathedral’s domes sprout up like mushrooms, bursting from the main building in a texture that shifts with every step you take. Like most buildings in Sofia, it contributes to the nonlinear narrative that is Bulgaria’s history: built only 100 years ago, the icon is named not after a saint (as is common in Eastern Orthodoxy), but after a Russian prince, Alexander Nevsky, as thanks for Russia’s efforts in liberating Bulgaria from Ottoman rule in the Russo-Turkish War of the late 1870s. But only decades later, during the First World War, when Bulgaria and Russia were pitted against each other, Bulgarian officials renamed it the Sts. Cyril and Methodius Cathedral. By 1920, the government decided to swap back the original name in solidarity — an irony today, since Bulgaria’s entry into the European Union has distanced them once again from the spectre of Russian influence. 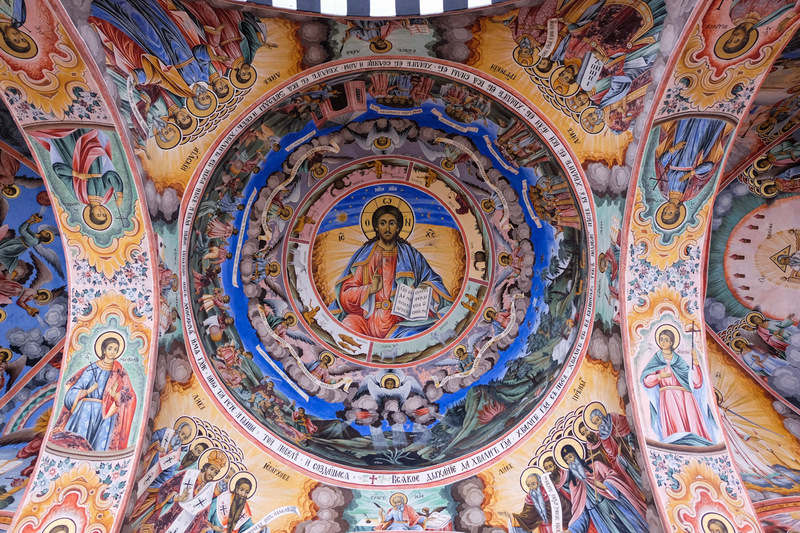 The colourful fresco ceilings of the Rila Monastery. We were surprised that such a titanic emblem of the country felt so casual on the inside. There was no real security, only a handful of tourists and no pews for sitting. (This, too, is typical of Eastern Orthodox churches; there are only a couple benches along the edges for the sick and elderly. For mass, congregants cluster on their feet.) The broad walls are covered in the original murals, cracked and faded in colour, seemingly untouched since the artists’ first laid their brushes on them more than a century ago. I can’t say whether the place is always so empty, or whether this was just the case in early January. Regardless, the grandeur of the vast ceilings contributed to a powerful echo once the choir began their songs. We couldn’t see our friend — the choir stands above the entrance, deliberately blocked from view, perhaps to not distract from the altar’s focal point. Instead, we watched as locals took turns approaching the photo of Jesus placed in the middle of the main hall, crossing themselves in silent prayer, bending over to kiss the portrait and gently lay their fingers on his face. The solemnity of the choir, the mysticism of the rituals, the dimness of the scenes painted all around us all swirled into a touching, intimate moment between the 50-odd congregants in this gigantic church — especially for this Jewish observer, whose idea of church stems more from American preaching than rattling gold-plated thuribles perfuming the air with frankincense and myrrh. This was not the emptiest church we’d see in Bulgaria, however — nor the most beautiful. The beauty of cultural off-season travel is that you can enjoy your host country’s most popular sights to yourself. 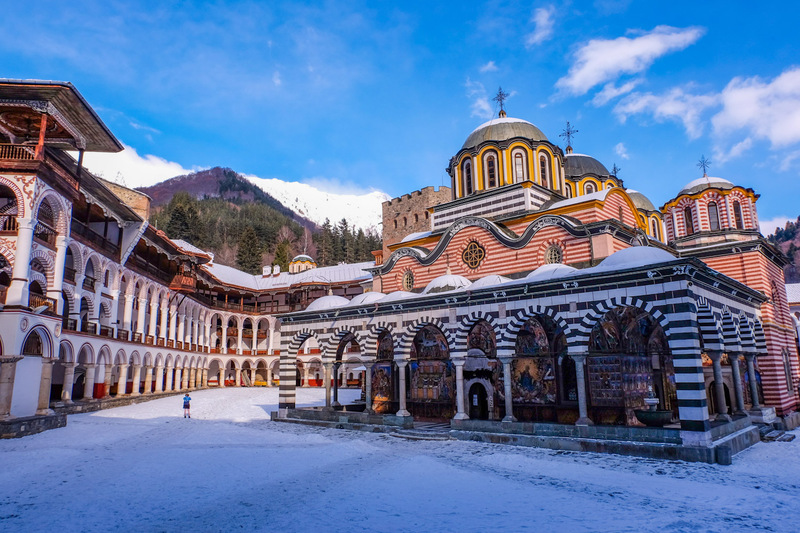 Vee and I went with Traventuria, a Bulgarian tour operator, to visit the Boyana Church and Rila Monastery, both UNESCO-protected gems of the ancient Orthodox world dating back to the 10th century. 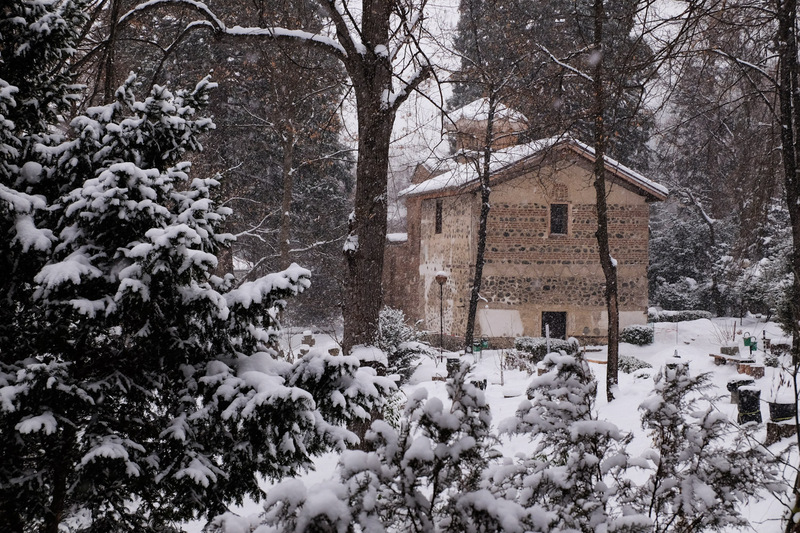 The Boyana Church, a modest stone structure surrounded by forest. Outside, wet snowflakes dropped on our heads, coating the forest in that kind of perfect clean whiteness usually reserved for Christmas cards. It made for beautiful photos, but horrible driving; thankfully, Lubo knew his way around these parts, and kept our minivan steady in the steadily decreasing mountainside visibility. In the summertime, Lubo packs full-sized buses on this tour with as many as 40 people on this route. Today, there were four of us. Because of the low demand, the high-season 30-euro ticket price is upped to 35 to cover the basic costs, but it’s arguably worthwhile for a near-private tour of the near-deserted Rila Monastery, calmly imposing, with just a few black-robed monks wandering among the upper levels. Vee stands in the vacant Rila Monastery. No one in the group seemed nearly as thrilled, but the cold energized Lubo; he led us behind the fortress-like stone walls of the hefty mountain monastery and inhaled the brisk air with zeal. “For me, this is the most beautiful monastery in Bulgaria,” he said by way of a not-especially-controversial introduction, then launched quickly into its history. Founded by a hermit monk, St. Ivan of Rila, the eponymous monastery has long been a safe haven for Bulgarian culture during the nation’s myriad occupations. Bulgarian emperors revered it; the Ottomans destroyed it; the Russians helped rebuild it. Only one tower remains from its 13th-century years, built like a guard tower, in keeping with the structure’s militaristically defensive architecture. READ MORE: Four Oceans, No Planes chronicles one couple’s epic north-south Eastern Hemisphere trip! Bright frescoes adorn the external walls like pious comic strips, telling picaresque stories of angels and demons. The complex was built to accommodate 200 monks and pilgrims, but, Lubo lamented, “the truth is, nowadays, it is not so popular to be a monk here.” I saw two remaining dwellers scuttle across the snowy ground, as if to prove his point. There are two restaurants just outside complex, and Lubo recommended the one that still made “monastery bread,” a warm, crusty, delectably soft dough baked fresh in the original stone ovens that have been popping out loaves for centuries. It lived up to the hype. We paired it with a minty bean stew and shopska salad — the latter’s lingering fresh cheese and acidic tomato juice blending into a perfect bread dip — while a wood fire crackled behind us and I sipped on a tin goblet of hot, fruity mulled wine. For a final moment, we forgot about the cold outside, and dined gleefully, grateful for having the place to ourselves.